Sadly, the Blazer SS won’t utilize the Camaro’s 6.2-liter V8 with 455 hp. Instead, it will get the same turbocharged 3.0-liter V6 found in the Cadillac CT6, which produces 404 hp and 400 lb-ft of torque, paired with a 10-speed automatic. That makes it more powerful than the Edge ST, but still no match for the 700-hp Jeep Trackhawk. 0-62 mph takes 5.3 seconds before the Blazer SS tops out at 155 mph. All-wheel drive of course comes as standard to handle all that extra muscle. Chevrolet hasn’t released any images of the high-performance Blazer SS yet, but previous render images give us a good idea what it could look like. An aero-enhanced body, black trim, and larger 21-inch wheels give the SUV a meaner look. The Blazer SS also has lowered suspension to give it sportier handling and beefier brakes to increase the stopping power of the high-performance crossover. 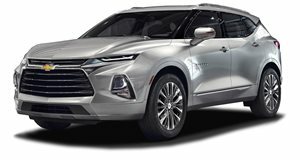 Pricing details and a launch date will be announced at the 2019 New York Auto Show but expect Chevrolet to charge a premium over the standard Blazer for the extra performance, which starts at $28,800.